An artist's depiction of the Gaia spacecraft mapping stars in the Milky Way. Scientists have identified the corpse of a galaxy that fell into the Milky Way about 10 billion years ago in what was likely the last major overhaul to our home galaxy during its development. That's the conclusion of new research based on 2 billion measurements of how stars within the Milky Way are moving. Those measurements let scientists identify about 33,000 stars that live in our galaxy but were born elsewhere, carried here during a giant galactic collision. The research is possible because stars contain a fingerprint of sorts of their origin. "When you look at how stars move, they actually retain in their motions [a] memory of the place where they were born," Amina Helmi, an astronomer at the University of Groningen in the Netherlands who led the new research, told Space.com. Helmi and her colleagues drew on data from a European project called Gaia, which is mapping the location of 1 billion stars in the Milky Way with unprecedented precision. The team identified a set of about 33,000 of those stars that are moving in a completely different manner compared to the bulk of the Milky Way. 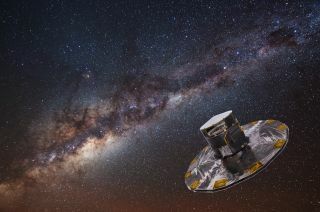 The team also studied the chemistry of nearly 600 of those stars using ground-based telescope data, which confirmed that these stars had come from somewhere beyond the Milky Way. And the sheer amount of data at the team's fingertips let the scientists estimate the size and age of the colliding galaxy. Given those numbers, the researchers said, the former galaxy was likely about a fifth the size of the modern Milky Way. That means that while this is hardly the only galactic collision scientists have pinpointed, it's a comparatively huge one, the scientists said. Helmi and her colleagues named the former galaxy Gaia-Enceladus to honor the instrument that gathered the crucial data Helmi used to address a question that's been nagging her for two decades. In Greek myths, Enceladus is the giant son of Gaia and was buried below Sicily, causing seismic activity — and the galactic burial would have caused quite a lot of upheaval as well. The team's simulations suggest that the collision seeded stars into the inner halo of our galaxy. The collision's huge injection of stars and gas may also explain why the Milky Way has such a thick disk, Helmi said, although Johnston said there's more work to be done before scientists can fully flesh out how that might have worked. There's lots to love about knowing more about how our own home-sweet-home galaxy came to be, Johnston said. But for her, the implications of research like this stretch far beyond the Milky Way, she said. She compared studying the universe to photographing 1,000 humans, where all you can tell is how many there are and perhaps their hair color. Studies like this are a detailed portrait of one individual from that mass. "We're actually not just seeing the freckles on the faces — we're seeing the flecks in the eyes," Johnston said. "It's like seeing the inner workings of a person. We're seeing the inner workings of a galaxy."